Pyridoxal 5'-phosphate is a necessary coenzyme. By utilizing the apoenzyme (TYDAPO), prepared from cells grown on a vitamin B6 deficient medium, pyridoxal phosphate may be determined. See Umbreit et al. (1945) and Gunsalus and Smith (1957). Decarboxylation of radio-labelled tyrosine has permitted the determination of much smaller amounts of pyridoxal phosphate (Maruyama and Coursin 1968; Sundaresan and Coursin 1970). Acetone-dried cells were used as the source in a relatively simple extraction and purification of the apoenzyme. The holoenzyme may be used to determine tyrosine, phenylalanine and dihydroxyphenylalanine either manometrically or colorimetrically. Tashian (1957) has reported a determination of tyrosine in urine based on this principle. Plasma phenylalanine can also be determined using this enzyme. The original method was described by Udenfriend and Cooper (1953), and modifications have been published by Hsia (1959) and Knox and Messinger (1958). Poisner (1960) determined serum phenylalanine levels in schizophrenics using Hsia's method and obtained a significant elevation over normals. 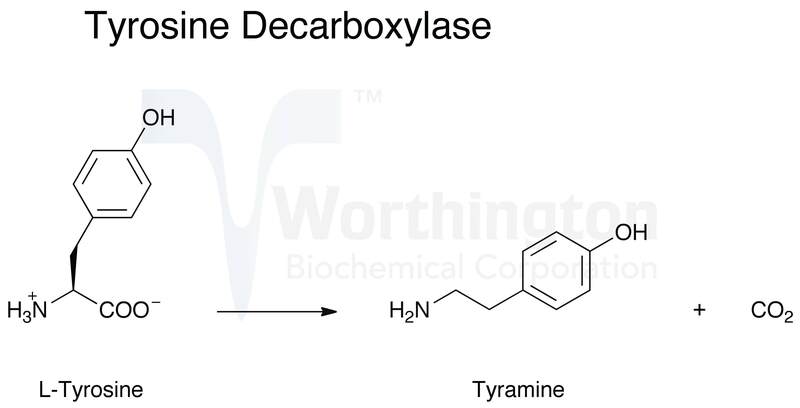 The amino acid decarboxylases have been reviewed by Boeker and Snell (1972). See also Snell and DiMari (1970). Optimum pH: 5.5 (Boeker and Snell 1972). Specificity: L-phenylalanine and dihydroxyphenylalanine are acted upon at a much slower rate than L-tyrosine. Inhibitors: Heavy metals (Ag+, Cu2+, Fe2+, Fe3+, Pb2+) KCN, NHOH, N2H4, and SO4=. Stabilizers: Glycerol 10-25%, mercaptoethanol (5 mM) and L-tyrosine (0.5 mM) (Chabner and Livingston 1970; Sundaresan and Coursin 1970).